Attic mould may not always affect the indoor air quality of your home, but it can become a serious problem if left unhandled. Why does mould scare homeowners so much? What are the causes of mould in the attic? How can you get quick help to remove the mould and restore your peace of mind? Here’s everything you need to know! What Causes Mould in the Attic? Leaks in your roof that are left unattended or unnoticed will lead to mould. Mould loves places with darkness and moisture, so your attic and basement are the two primary places mould can happen. To prevent mould from forming in your attic, perform regular checks of the area. Look for discoloured insulation and wood, and check skylights, chimneys, windows, and the ceiling for any leaks or cracks. 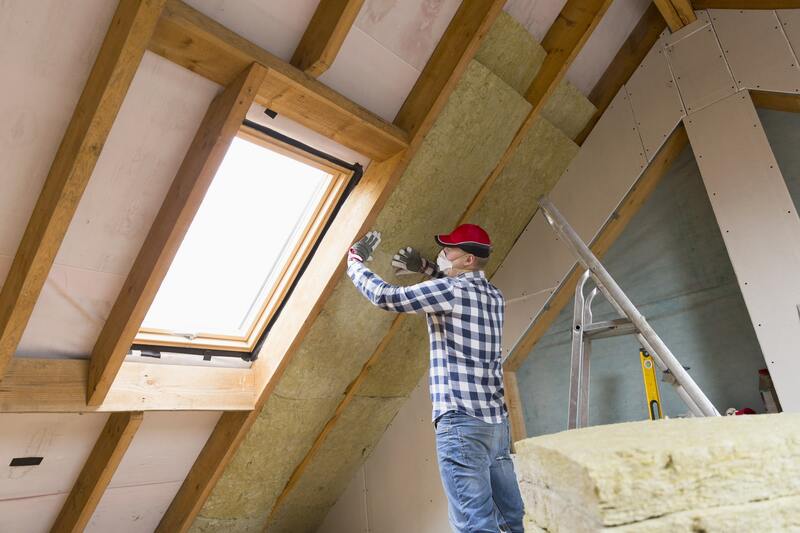 Improper ventilation in your attic can lead to a build up of moisture in the air. This is because air travels upwards, so moisture accumulated from cooking, showering, bathing, and cleaning will travel upstairs. If there is no ventilation in the area such as fans or open windows, the moisture can get trapped and lead to mould problems. Another reason why moisture can get trapped in the attic is because of vents blocked with insulation. This is a very common occurrence and often leads to mould growth. Is Attic Mould a Health Concern? Two types of mould can pose a risk to your health—black and white mould in the attic. Black mould is caused by an excessive buildup of moisture without proper ventilation. Although it is called “toxic mould” it cannot kill you. It is, however, linked to allergy-like symptoms and can cause poor indoor air quality. These symptoms may include skin or eye irritation, nasal congestion, wheezing, coughing, and upper respiratory tract symptoms. The sooner this mould is removed, the sooner the symptoms will clear up. White mould is also commonly found in the attic, but is can be tricky to notice. Due to its colour, white mould can easily be mistaken with efflorescence, which is a cosmetic buildup of salt deposits caused by water seepage. The best way to tell if you have white mould in your attic is to look at where it is located. White mould is most commonly found on wood or drywall and can cause symptoms similar to black mould, such as coughing, eye or skin irritation, and other allergy-like occurrences. Is Mould Bad for Your House? The reason why mould scares homeowners so much is because if left unchecked, attic mould can grow and damage the structure of the roof and the elements connected to it. It also stains the attic and causes it to look unsightly, which is a big deal if you’re planning to sell your home in the near future. Mould should be inspected because it is a sign of an underlying moisture problem. It only takes 24 hours for a moisture event to cause mould, so the sooner you act the sooner you can get your home looking back to normal. Find Roof Leaks: Roof leaks are one of the most common causes of attic mould. If you see discolouration at the joints of your roof or where two materials meet, it may be the site of a moisture event. You can prevent mould from infiltrating your attic by removing the mould and patching up the spots. A professional mould removal company will have the right tools and equipment to do this safely without damaging the integrity of your roof. Check Your Shingles: Raised shingles can lead to mould in your attic because it exposes the interior joists and structures to wind, rain, and other elements. Ensure Good Ventilation: To prevent mould in your attic you must ensure proper ventilation. Find a way to keep the air moving through your attic space, such as using a fan or an air purifier. Drying out the area by using a dehumidifier is also a quick and effective way to solve the problem. Search for Gaps: Skylights, moisture barriers, duct work, plumbing, and insulation can be sources of moisture leaks in your attic. Be sure to check for gaps around these components and have them repaired to prevent moisture from getting trapped in your attic. Spray the Walls: A helpful step in killing mould growth in your attic is to lightly coat the ceiling and structures with a mould-killing substance. Natural remedies are quite effective—you can use a mixture of half vinegar and half water in a spray bottle and spray the mouldy area. You can also mix tea tree oil into a spray bottle with water and spray the mouldy surfaces. Both of these methods can kill the mould that already exists, and will prevent more from growing. If you’ve noticed mould growing in your attic, a small area may be treatable on your own. However, most homeowners only notice mould after it has spread, seemingly, to the point of no return. Since mould can travel by air through different substances, it can be difficult to tell if it has spread further. The best way to ensure that all your mould has been spotted and treated is by hiring a professional mould removal company to tackle the job. For quick and effective mould detection and removal, Flood Services Canada can help you. Our professionals offer a variety of services and solutions to problems related to water damage, and we can help you settle with your insurance company to save you money. We deploy our quick-response teams to cities across the Greater Toronto Area to help homeowners save their home in emergency situations. We provide sewage, water damage, and food cleanup services and will use the best techniques, personnel, and equipment to ensure your home is clean, safe, and dry as soon as possible. Contact us at (416) 302-2107 to learn more about our services, or use our emergency hotline at (416) 999-3930 to get our rapid-response teams deployed to your location.